Encouraging your kids to solve their problems on their own is difficult, but will teach them to evaluate their problems and find the healthiest solution for themselves. June is Student Safety Month, so what better time to discuss a very important topic: teen driving. The time between Memorial Day and Labor Day is the most dangerous and deadly time for teen drivers, but following certain precautions and being aware of common mistakes could prevent them from happening to you or your teen driver. Dogs, cats, hamsters, birds and turtles, oh my! Having a family pet is a lot more than simply enjoying a little critter running around the house. A family pet benefits the entire family in a multitude of ways. 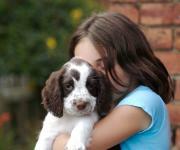 Continue reading to see how having a family pet will benefit your family. Whether you are finishing your first year of middle school or your last year of high school, the end of the school year is always the most difficult. Students contract “summer fever” as the end of the year approaches and begin to slack off and lose interest in school work. It is extremely important to finish the school year strong, so we have put together a list of 10 ways to finish the school year strong. Being able to write a thank you note is an important skill for your children to have and will come in handy throughout their life as they interview for jobs, receive gifts or are offered kind gestures. A great way to get kids to understand bullying is to have them read a book that shares stories of those who have been bullied and those who stand up to bullies. We’ve compiled a list of books that are great for learning lessons associated with being a bully, being bullied and standing up to bullies. Teachers play a very important role in the lives of children; it is important to recognize all of the effort put in by teachers to make a positive impact on their students. Tuesday, May 7, is National Teacher Day. College Nannies + Tutors would like you to take this day as an opportunity to thank and acknowledge the work done by teachers you know. Where would you be today, without them? Distracted driving is one of the top causes of car accidents in the US. This is true even though distracted driving is 100% preventable. Keep your family safe by following the tips below. Together we can put an end to distracted driving.